Two years ago I had an e-mail exchange with Howard King. In the course of our discussion, he sent me a photo of a wood dough bowl he had carved. I was impressed, and I told him I had always wanted to carve a dough bowl myself. Howard replied that he had most of the tools I needed and was looking to sell them. I said I would buy them. Howard told me exactly what tools he had to sell and the price he wanted to get. I hadn't really looked into the price of such tools and was surprised at how expensive they were. But when I did an internet search, I found that the price he wanted was not out of line. I ended up paying $600 for seven different carving tools. After acquiring those implements, the only tool I lacked for carving my own dough bowl was an appropriate broad hatchet. For another $150 (or so) I could buy a decent hatchet online. 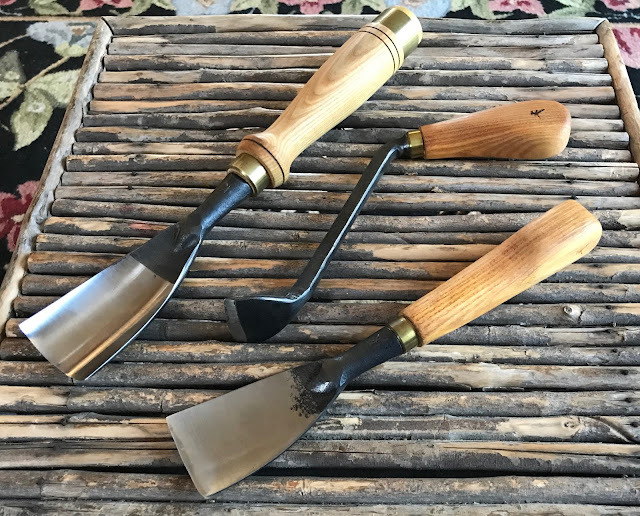 Two or three times that would get me a more serious, top-shelf carving hatchet. But, considering what I had already spent, I decided to hold off on the hatchet. I didn't have the time to be carving a bowl then anyway. It would be a future project. So, Howard's carving tools went up on a shelf in my shop, and they have been there ever since. That is, they were on the shelf until last week. That's when I reasoned with myself that I would probably never get around to carving a dough bowl, and I might better sell those tools. It's a lean time of year, and I really do need to do some purging in order to to better organize my small workshop. Among Howards's tools were three unique, and somewhat rare gouges (pictured at the top of this page). When I first got them, I noticed that they had my initials on them. It hadn't occurred to me that Howard and I have the same initials of HK. 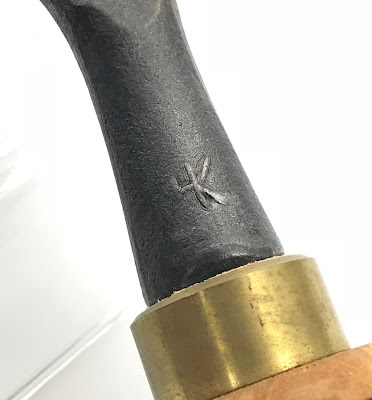 But the initials were actually forged into the metal of the tools, and they were the maker's mark of Hans Karlsson, a man from Sweden. Hans Karlsson is famous for making the finest carving tools in the world. 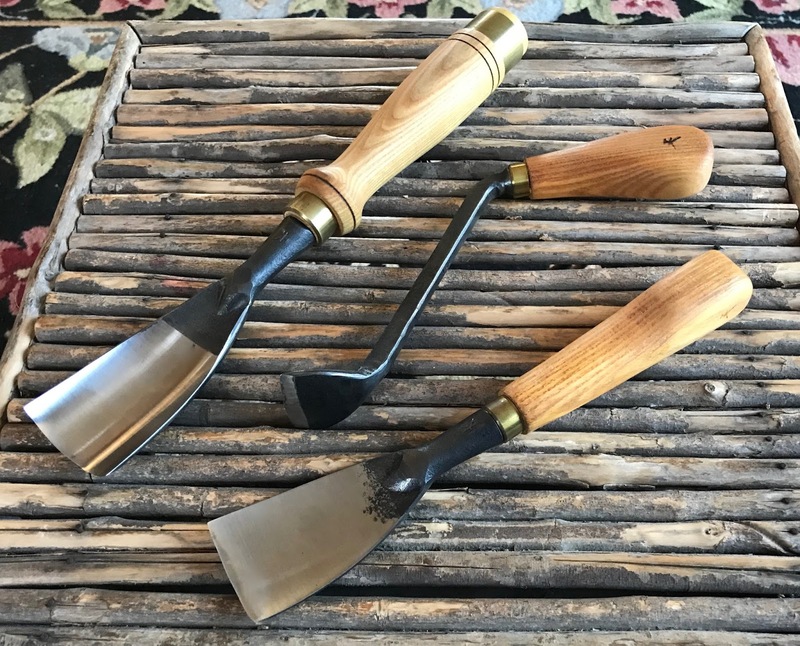 Karlsson's hand-forged tools are so famous, and in such short supply, that you can't buy them. In the US, you have to get on a waiting list to buy Karlsson's tools from a single seller, and the list is no longer taking names. Evidently, there are more people who want to purchase Karlsson's tools than there will ever be tools to sell. Even the online European sellers of HK carving tools are all sold out. So, I listed all of Howard's tools on Ebay, hoping that I might recoup my initial cost, as well as the Ebay fees and PayPal transaction fees. The three HK gouges were listed in the auction format. There was a lot of interest in the gouges. Over 40 watchers on each one. The auction ended last night. Those three hand tools fetched enough to recoup my original cost, along with selling fees. And there was some extra left over. So, in the end, spending $600 on the tools a couple years ago wasn't as crazy and fiscally foolish of me as I had thought it was at the time. I'm relieved at the outcome of this story, and I'm perfectly okay with not making a dough bowl. But I have also long wanted to make a twig coffee table. The nice thing about twig furniture is that it requires only basic (and cheap) tools. A hand saw. A knife. A drill. And, in the meantime, keep watch for HK tools. Perhaps someday you will see a Hans Karlsson chisel for sale at a flea market. Wouldn't that be something! It will become obvious to you sooner rather than later that you should have kept them.